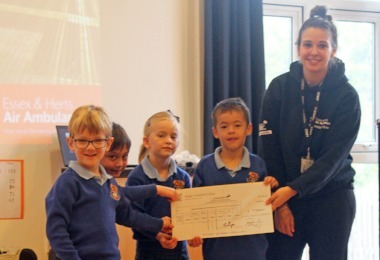 Following all the fundraising projects carried out by Pre-Prep pupils last year, Jeannie from Essex and Hertfordshire Air Ambulance joined the pupils in morning assembly on Thursday 18th October to be presented with a cheque for £2,298.84. Jeannie thanked the children for this very impressive donation, as she explained that the air ambulance is 100% funded by the public. The pupils heard that just one helmet costs around £1,100 and one helicopter costs approximately £6.5 million, not including the cost of fuel, the four crew members and all the medicine. The Air Ambulance do an amazing job and we were very proud to have made a contribution to this very worthy cause.